If you are a bird lover, then you should know that having a parrot is great fun. 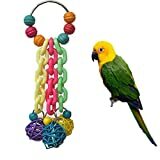 However, just like other animals, it is important that you have plenty of parrot toys available so that they will remain entertained and stimulated. Parrots love to destroy toys so you may want to have plenty in reserve. This is healthy for them and necessary for their behaviour. Aside from the basic needs like food, water and shelter, parrots really need plenty of toys. They are essential for your parrot's growth and development. The toys will provide mental and physical stimulation. It will also keep the beak of your parrots trimmed. Searching and foraging for food entertains the parrots a lot and help keep their natural instincts in tact. However they cannot do that at home because they are caged. So when you have parrots at home, the best thing to give them is a toy. The beaks of parrots grow out just like our fingernails. With the toys, their beaks will be trimmed and they will be entertained. Ensuring your parrot has plenty of toys will also help reduce boredom and bad behaviour! There are a number of toys that you can choose from. Some toys are designed to stimulate your parrot mentally; others physically. For example, exercise toys and grasping toys are for physical exercise while puzzle toys are for mental stimulation. Let's have a look at each type of parrot toy. These are puzzle toys that have treats inside them. 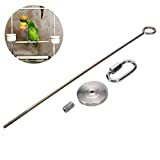 This type of parrot toy encourages the parrot to find a solution and solve the puzzle so that the treat will come out. Some of these puzzle toys are boxes with simple lids and boxes that require the parrot to unscrew. 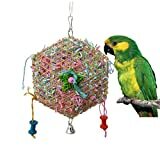 If your parrot is shedding, this type of toy will be very useful. This can keep the beak of the parrot trimmed and other items free from damage! Preening can help maintain a parrot's feathers. It's been found that if you parrot has one or more toys to preen, it is more likely to preen itself. These are toys that have rings and ladders where your parrot can climb, hang, or swing. Great for physical exercise and agility! 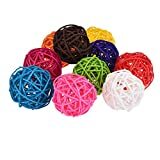 These are toys that your parrot can 'grasp'. Great for the dexterity and encourages them to use their hands (or feet)! When you are going to choose a toy for your parrot, do not just buy any toy that you see. There are some things that you have to consider when buying toys for your pet parrot. The very important factor is that the toy must be safe for your parrot to play with. Avoid toys with small parts, ink, staples, and other suspect substances or materials. 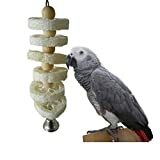 Parrot toys are essential to encourage physical and mental fitness. 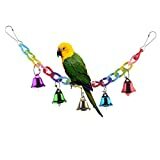 They provide entertainment and stimulation for your parrot which goes a long way towards a healthy and happy bird!